You’ve probably heard of it and saw it on TV. The famous house where the Tanners live is probably one of the most popular tourist destinations in San Francisco. So don’t be surprised if you find out that you’re not the only one who loved the opening scenes of a famous 1980s TV show at even the 2016 Fuller House and wish to personally see the place for yourself - a LOT of thirty-somethings who grew up watching the show want to as well. Before anything else, you’ll want to know that the Full House isn’t exactly what it seems. The truth is that the opening credits was actually created by filming two different spots, even when filmmakers intended it to look like it’s just one place. In case you haven’t realized it yet, Tanner’s family address - 1882 Gerard - is fictitious too. Go ahead and try looking for it on Google Maps and you won’t find it there. You won’t find any map for Full House online as well. So what do you have to do to be able to see the houses used to shoot that famous opening scene? Read on. Where is the Full House found in San Francisco? Family Picnic Scene: Part of the famous opening credits is a picnic scene which was shot in Alamo Park Square. It’s roughly two miles from San Francisco’s downtown area and just near the Fillmore and Hayes Valley Districts. Row of Victorian-Style Houses: More popularly known as the Painted Ladies, the scene was shot between 710 and 722 Steiner Street. If you climb the hill behind them, you’ll find yourself admiring the breathtaking San Francisco skyline. Tip: You might want to avoid taking a car to Alamo Square because parking can be a nightmare with all the people going there. Instead, it’s better to catch a bus from Union Square. Alternatively, you can take an Uber or Lyft to the destination. Just indicate Alamo Square Park as your destination on the app. House with the Red Door: If you can vividly recall the family’s home that has a red door, you’ll be able to remember that the entrance of the house is found on the right side. Interestingly enough, there’s only one house among all of the Painted Ladies that has an entrance on the right. Unfortunately, there’s no red door there. That bit of detail is found somewhere else entirely, specifically one mile away from Alamo Square. 1882 Gerard: If you want to see the house the Tanner family enters after their picnic, you’ll want to go to a place called Lower Pacific Heights, which is north of Geary Boulevard at the west side of town. As mentioned before, the address isn’t actually 1882 Gerard. The actual address is 1709 Broderick, and the filmmakers took exterior shots of the place for the show. The place is in fact quite huge, spanning and area of 3,125 feet. According to the Hollywood Reporter, Jeff Franklin had purchased the property sometime in 2016, saying that he just couldn’t resist doing so. One interesting fact about the house is that the roof line features a lot of San Francisco Victorians. This is a trick that’s used to make the house look a lot bigger than it actually is. Tip: Want to take a great photo of the Full House set? Keep in mind that the house faces east. Try to go there sometime in the mid-morning when the sun is peeking just above the building right across the street. This guarantees that the house is well lighted. Otherwise, you might end up with a photo that’s largely gray and blue. Note: Don’t expect the house to have a red door. The house itself has been repainted as well. It’s still a nice house to look at, though. To get to the house with the red door, you’ll have to travel a mile from Alamo Square. Again, you take the 5 minute drive if you can bear the nightmare that is parking. Most people, however, either walk there for 25 minutes or take the public transit which is 25 minutes as well. You can also take a Lyft or Uber there. And another thing: keep in mind that the actual house is still a residence. Just because you can see the house all over the internet doesn’t mean that you can just invade the property. Don’t go around doing whatever you want in front of the house unless you have the owner’s permission beforehand. In the eyes of the owner, you are still strangers taking pictures of the front porch - something that would make you uncomfortable if others did the same thing at your home. Where is the Red Door? Still can’t find it? The truth is that it’s been removed and sold to someone else. The location of the red door or address of its new owner is now unknown. Chances are, the door may not even be red anymore, assuming that it still exists. The Fuller House House: The 2016 Netflix sequel now has a different scene for the opening credits. The show now features a drive along the Golden Gate Bridge. There’s also a family picnic scene but no more Painted Ladies. Of course, they all go through the iconic red door after. Don’t forget to check out Alamo Park! 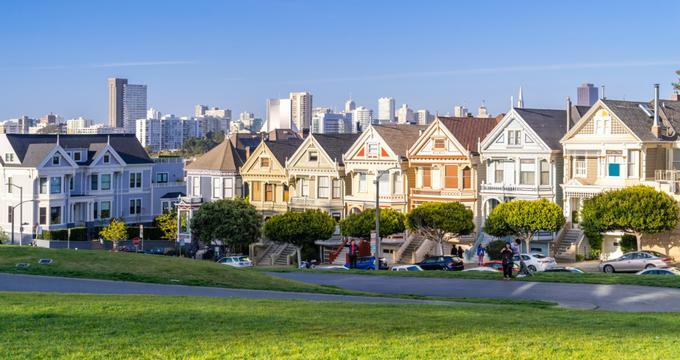 It’s nice that you’re visiting Alamo Square for the Full House in San Francisco, but don’t forget to check out the other sights while you’re there. The hilltop park features many breathtaking views of the city as well as various activities that you can enjoy. The place has tennis courts, walking trails, benches, a playground for children, and so much more! You can even bring your pets here. Alamo Square is a really nice recreational destination for locals and tourists alike, so try to make the most of your visit there.